The last kitchen concept design is for our bar. We have the same navy cabinets and marbled granite countertops. I love the look of pendant lights above the islands in kitchens. We have more of a peninsula. 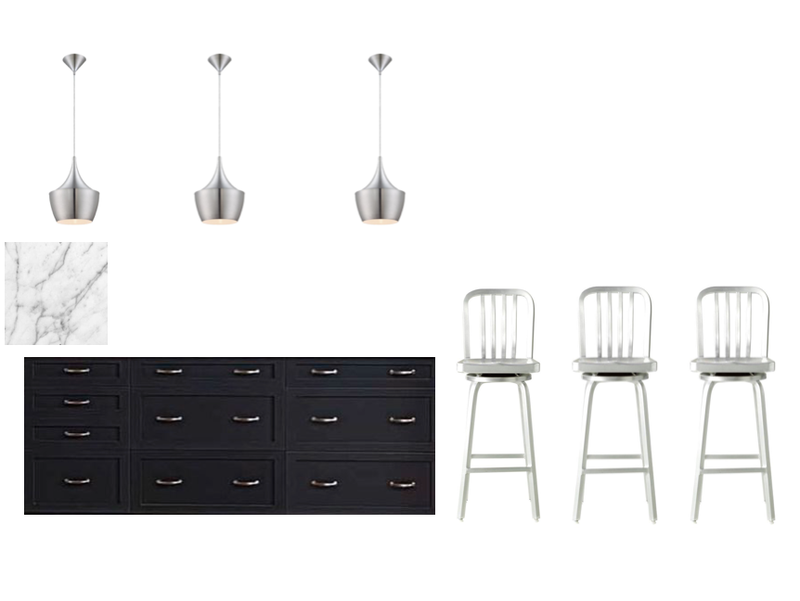 But I would still love to add some pendant lights. I found some brushed aluminum pendant lights that I felt went well with our kitchen appliances. I kept our stools in the same color scheme. I love the carlisle stools that you see everywhere but they were too short for our counter. I found some stools that kept the same metal look but fit our counter better. I am still not one hundred percent sold on the design for our bar. I feel like there is too much metal. It ties into our kitchen well but it is located right next to our dining table which has warmer colors. If you have any ideas please share!